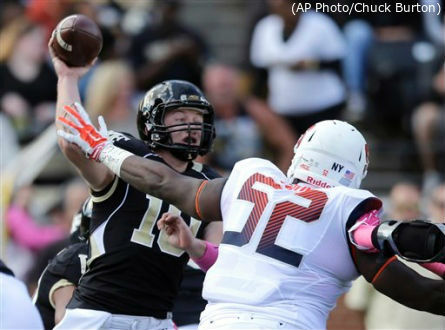 Can Tyler Roberson take the next step? In recent years, the Syracuse Men’s Basketball team has not had to wait long to see its players make “the jump.” I’m not talking about the jump to the NBA – although that has happened frequently, too – I’m talking about the jump that occurs in players’ confidence and skills as they adjust to major college basketball. Dion Waiters and Michael Carter-Williams leapt from small roles as freshmen to lottery picks after impressive sophomore campaigns. Tyler Ennis made the jump before he even arrived on campus. But last season was different. It took Rakeem Christmas four years to reach his potential, but his senior-year jump turned him into a second-team All-American. Kaleb Joseph, on the other hand, struggled to adjust to the college game during his freshman campaign. Injury prevented us from seeing if Chris McCullough would make the jump, even though he ultimately took the plunge into the NBA. For the first time in several seasons, Syracuse fans had their patience tried. For the 2015-2016 season to be successful, Syracuse will count on rising junior Tyler Roberson to make the jump. Wings have historically thrived in Syracuse’s offense. In fact, last season was the first since 2008-2009 that a primary wing failed to average in double figures. Primary wings have led the Orange in scoring in 10 of the last 13 seasons, a list that includes CJ Fair, Kris Joseph, Wes Johnson, Donte Greene, Demetris Nichols, Hakim Warrick, and Carmelo Anthony. For the players on that list who stuck around for more than a season, each one made vast improvements from sophomore to junior year. Joseph improved his scoring form 10.8 to 14.3 points per game, Fair jumped from 12.9 to 16.7, Nichols from 3.9 to 13.3, and Warrick from 14.8 to 19.8. Roberson will be the next great wing to make this jump for Syracuse. Last season, he averaged 0.129 win shares per 40 minutes, which is more than McCullough’s 0.126 during his 16 games. Nichols averaged just 0.90 win shares per 40 minutes his sophomore season, but he improved this to 0.131 the following year. Roberson’s biggest problem last season was consistency. At times he completely disappeared from games, such as the 11 minutes he played against Boston College that netted just one point and four rebounds. But at other times he showed flashes of brilliance, such as the following game against Duke where he effortlessly spun to the basket for scores en route to a 19-point, 10-rebound, 0-turnover performance. By the end of the season, Roberson had begun to demonstrate his abilities on a nightly basis. He scored in double figures in five of the final seven games of the season, a feat he only accomplished in seven games the rest of the season. During this span, he shot 49 percent from the field, well above his season average of 44 percent. The one ability that Roberson demonstrated throughout the season, even in some of his worst games, was rebounding. He reached double figures on the glass nine times, including six double-doubles. His 10.1 rebounds per 40 minutes average was only bested by Christmas’s 10.6. If Roberson continues to improve his scoring, he has the potential to offer a combination of offense and rebounding not seen in an Orange wing since Hakeem Warrick. Roberson already possesses touch around the basket. He needs to improve his jump shooting. Teams would often leave him open at the top of the key, a shot he was not afraid to take – at least until his clanging misses sent him to the bench one too many times. But this is a good sign. Roberson can make the 15-footer. His problem was that he would rush shots, often causing them to flatten out without arc. This can be fixed in a summer of practice. Next season, Syracuse will have no shortage of “go-to” players on the perimeter. 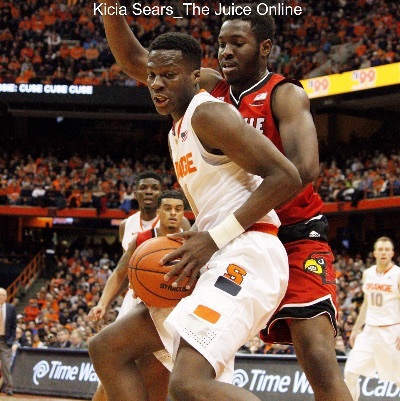 Trevor Cooney and Michael Gbinje are likely to lead the way for the Orange on offense. 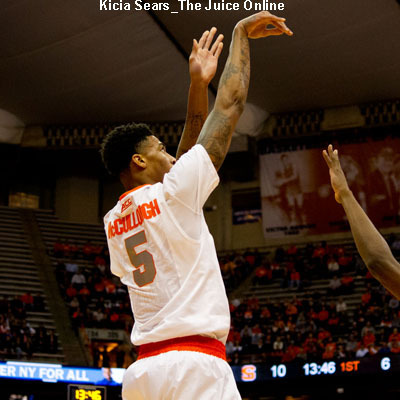 But down low, Roberson will be the player SU who makes the jump to become a star.